Make action a habit. Don’t wait until things are just right. There is never a perfect time to begin. There is only now. Expect that things will be difficult. Know that there will be setbacks. Remember how strong you are. Expect to succeed anyway. When you take action fear fades and confidence rises. 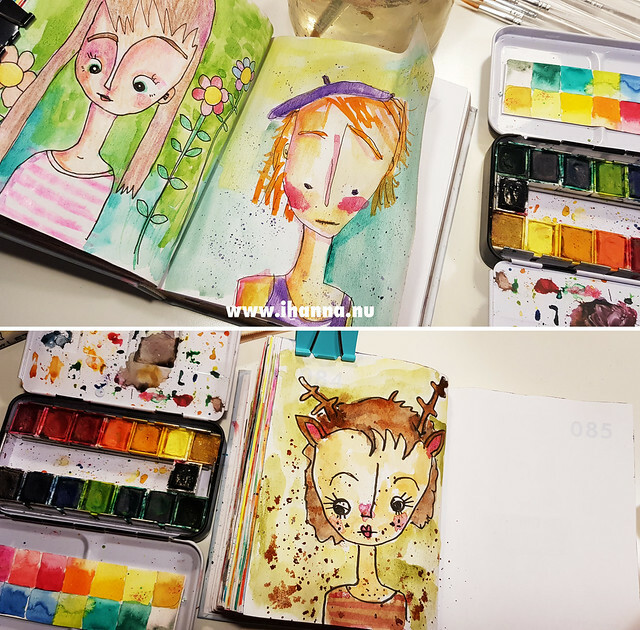 In March I painted little portraits in my little journal. I am not a portrait painter, so I was in no way aiming to paint anything realistic. Instead I’ve experimented with colors, forms and different ways to start. 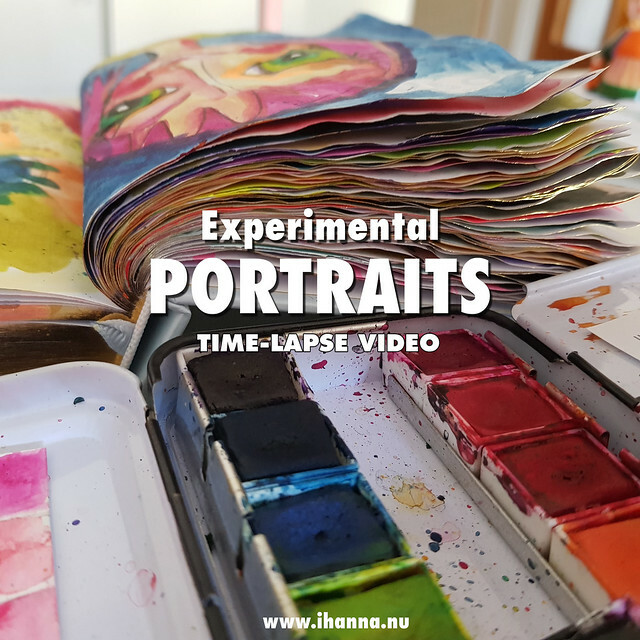 I filmed every time I sat down to paint, and I’m hoping that my approach might help loosen you up as well, to try some experimental portraits yourself. 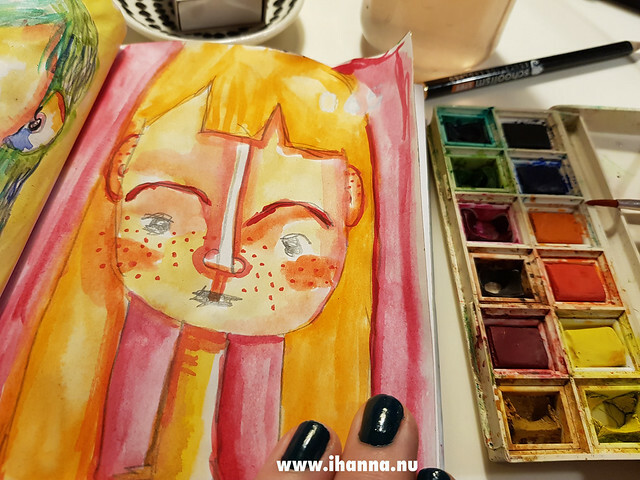 As grown ups we are afraid of failing, of creating something ugly and flawed, and nothing is as intimidating as trying to draw someone’s face. It almost never looks like them, right? Instead of imagining the worst, try to ignore what your brain is telling you about what a “successful portrait” must look like. Who cares what others think of it? Have fun! Remember the important parts; like the 2 eyes, 1 mouth and a nose, and play with placement, size and what details to add. Let it be “just for fun” and maybe exaggerate one eye (very big or very small or very narrow) so you don’t have to struggle with making the eyes exactly the same. That’s so hard anyway! This is what I did, and it was fun! 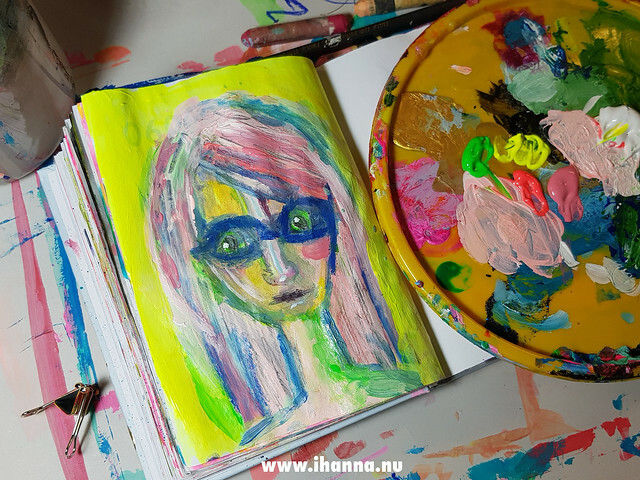 I love painting portraits with unusual colors, like girls with pink hair and green cheeks. Here’s the compilation of all of the time-lapse videos from March, filmed while each of the 31 pages were being born. Enjoy! If you can’t see the video embedded above click here to watch it on YouTube. Please give it a thumbs up and don’t forget to subscribe if you’re so inclined. I appreciate your support. But maybe half-way through I got a bit tired of painting the same thing I think (plus I was sick for a week and slid behind). Although it’s not like I really got tired of painting this kind of portraits I think, it was just getting tiresome to create a new one for every day. I would never commit to doing experimental portraits for a 365 project or eve a 100 day project! Non the less, I persevered. I created 31 little portraits and filmed every single one of them in time-lapse more. In the video I actually sped up some of the time-lapse video even further, so you wouldn’t get bored. It takes a lot longer to paint a portrait than it does to fill a page with mindless watercolor marks like I did in January. 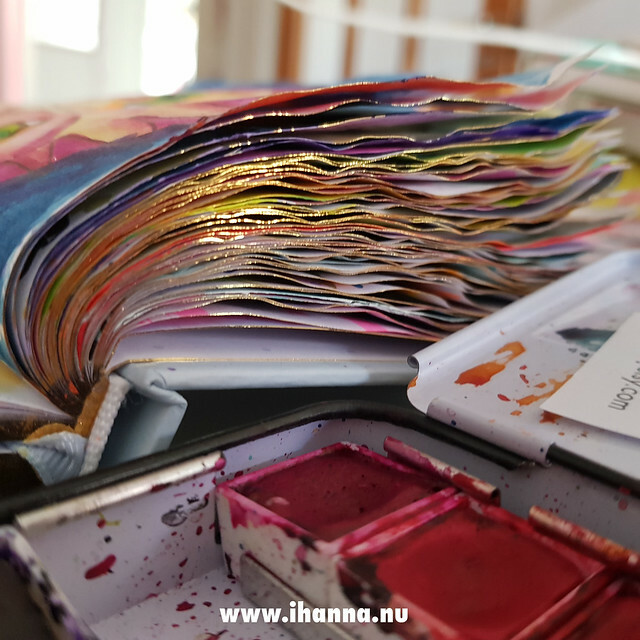 The Kikki.K 365 journal that I introduced earlier is holding up, and I am in love with how the gilded edges look from the side now that the first quarter of the year is painted. Love it! I have my favorites, and some I don’t like at all. What was your favorite? I’d love to know, just memorize the number on the page and let me know below. And maybe why you like it the most? 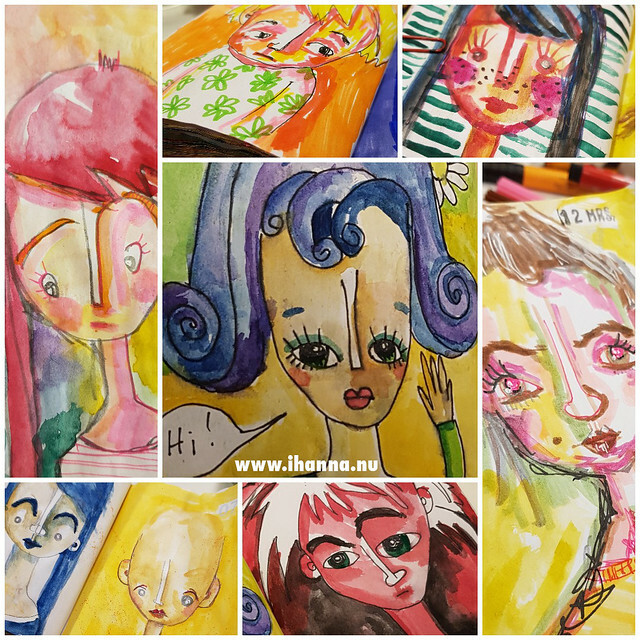 This entry was posted in A Creative Life, Art journaling, Creative habits, Draw & doodle and tagged daily creating, journal with ihanna, painting, time-lapse, video by me. Bookmark the permalink. I really am drawn to the red and black boy. Not sure why, but he’s my favorite! 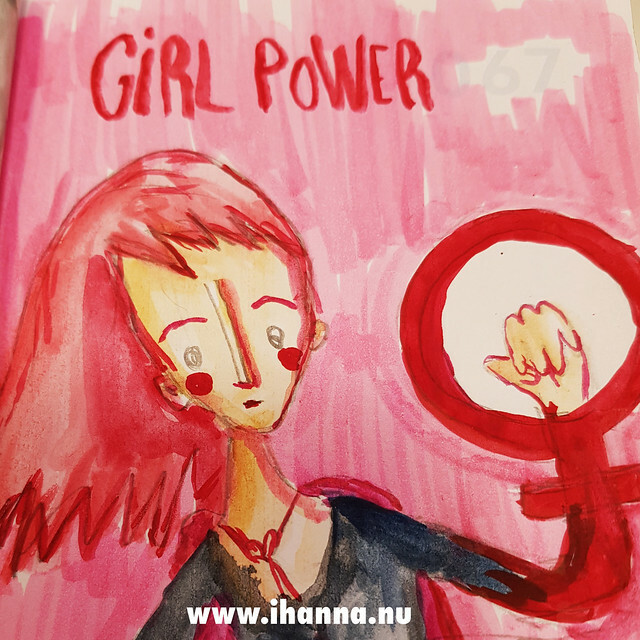 Thank you so much for sharing your wonderful artwork with us, Hanna! It’s so much fun to read about and watch the video! Can’t wait to see what you decide to do for April! Have fun creating!